Every chart created with think-cell has an associated datasheet. The datasheet is opened by double-clicking the chart or by clicking the Open Datasheet button that appears when the chart is selected. The datasheet also opens immediately when a new chart is inserted. 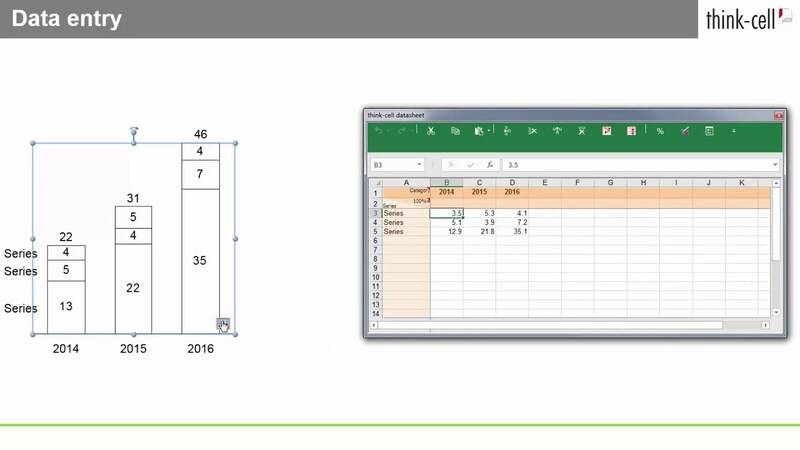 think-cell uses a customized Microsoft Excel sheet for data input, which you can use in the same way as regular Excel. You can use all the same shortcut keys, you can enter formulas instead of numbers, and so forth. 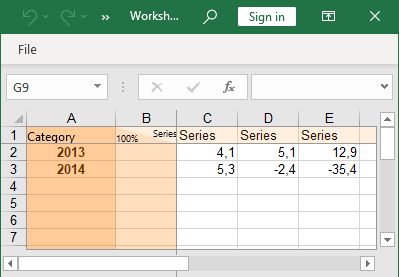 But of course you can also use an Excel file as a data source (see Excel data links). To insert or delete a row (or column) you can use the respective buttons in the toolbar of the datasheet. The standard buttons for undo and redo and cut, copy and paste are available as well. Note: If you have Microsoft’s Chinese Conversion feature installed, you will find the options Simplified Chinese and Traditional Chinese in the datasheet’s More menu. The think-cell datasheet alternatively supports entry of absolute or relative values. 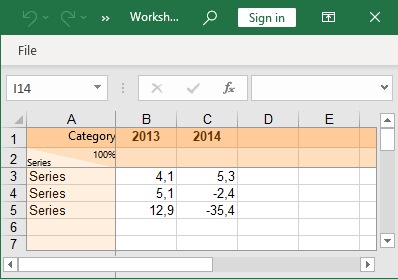 The distinction between the two types of data is made by the Excel cell formatting. You can always toggle the interpretation of a column’s data with the button. The default behavior of the datasheet depends on the chart type: 100%-charts and area or Mekko charts with %-axis as well as pie charts default to percentages, while all other charts default to absolute values. Transposing the datasheet lets you create charts where the datasheet would normally require more than 256 columns, and can often be used to simplify data entry when working with a large amount of data. 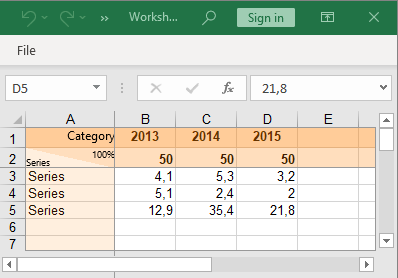 Note: The limitation of the number of rows and columns is due to the same limitation of Excel datasheets in general in Excel 2003. For compatibility reasons, the limitation also applies when using Office 2007 or later. In think-cell, the visual order of data in the datasheet always corresponds to the order of the data in the chart. This is also true for flipped charts (see Rotating and flipping elements). If you want to flip the data in the datasheet, you can use the Flip Rows (or Flip Columns) button in the datasheet’s toolbar. Note: This function is particularly convenient to convert data from former MS Graph charts, because in MS Graph data is entered in headfirst order. Using think-cell’s capture tool, you can extract the numerical data of the image and use it in a think-cell chart. Create a think-cell chart of the type you wish to use to present the extracted data, e.g., a stacked column chart. The chart type does not have to be same as the chart type in the source image. 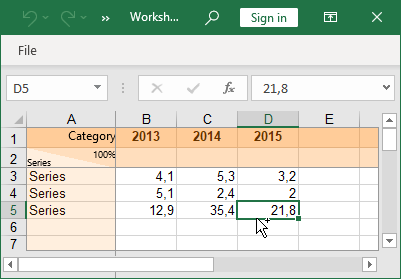 In the chart’s datasheet, click the Extract Numerical Data from Column or Bar Chart Images button in the toolbar. 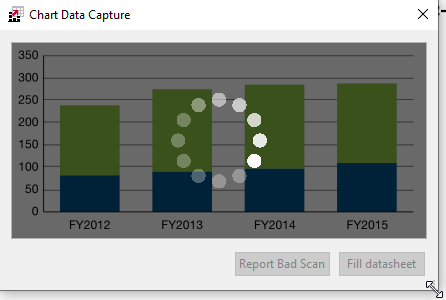 A capture window titled Chart Data Capture appears on the screen. 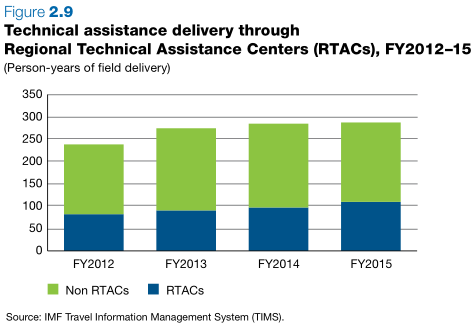 Drag and resize the window so that it covers the chart image. It is best if you restrict the gray detection area to the chart data area, i.e., without any chart title, but including axes and labels. Once the algorithm has finished analyzing the image, the Import button becomes active. 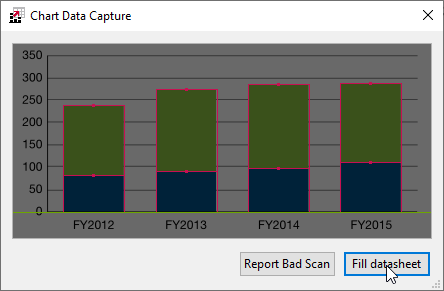 In the capture window, the detected baseline is highlighted in green and detected chart segment outlines are highlighted in red. Click the Import button. The extracted numbers are inserted into the datasheet window. To close the capture window, click the button in the top-right corner. In the chart, you can now use think-cell’s formatting to highlight aspects of the data or use difference arrows and other tools for analysis.